Hurricanes and wildfires that ravaged large portions of the U.S. in 2017 have increased the number of families experiencing homelessness and have renewed interest in the academic effects of not having stable housing. The negative effects of homelessness for children linger far longer than the experience of not having a place to sleep, according to a new study by The Education Trust–New York. In 2015–16, 1 in 10 students in grades 3 through 8 in New York state either experienced homelessness or had previously been homeless, and both groups were about half as likely to meet academic standards as peers who always had a home. More recently, two reports found that New York City is failing to provide homeless children with the services they need, and that the number of homeless children in New York City is growing. Social workers are overwhelmed with cases, and often schools aren’t following up with parents when the students are absent from class, according to a New York Times analysis of the reports. But experts say the problem is not limited to New York. Here are four things to know about the ongoing crisis. 1 A study using New York state data shows that the effects of homelessness outlast the experience of being homeless. 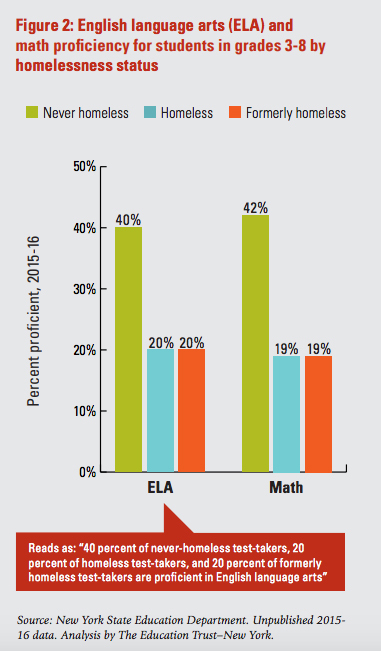 Statewide, about 20 percent of students who were currently or previously homeless scored proficient in English language arts, and 19 percent in math, compared with 40 and 42 percent of never-homeless peers, the study found. Some homeless and previously homeless students achieve at high levels in New York, but there is wide variability. “I think what really struck us was the fact that the proficiency rates for formerly homeless students are nearly the same as the proficiency rates for currently homeless students,” said Abja Midha, deputy director of The Education Trust–New York. The study also found that in New York, homelessness is a statewide problem, not limited to high-poverty regions or urban areas, Midha said. These findings are not limited to New York students. Research in Minneapolis Public Schools also showed that while some students experiencing homelessness or housing insecurity showed high resilience and achievement, they were also at a higher risk for academic problems than non-homeless students. 2 Homelessness affects more than a million children nationwide. About 1.3 million children enrolled in public school experienced homelessness at some point in 2015–16, an increase over the previous year, according to U.S. Department of Education data, but the real number is higher, experts said. “There’s no real sign of decline” in the number of homeless students, and the problem is nationwide, Duffield of SchoolHouse Connection told The 74. Although better staffing and reporting procedures in schools may contribute in part to higher numbers, they are not the only reason the number is growing, she said. Additionally, some children may not be counted if they are not in school. Research by the Chapin Hall research center at the University of Chicago indicates that at least 700,000 children ages 13–17 were homeless and unaccompanied for at least one night over the course of one year, which is far above the Department of Education’s estimate of unaccompanied homeless children. 3 Recent natural disasters have exacerbated the problem. At least 40,000 children are homeless because of 2017 hurricanes, according to a conservative estimate by SchoolHouse Connection. And that doesn’t include those affected by wildfires in California, which also destroyed homes, Duffield said. 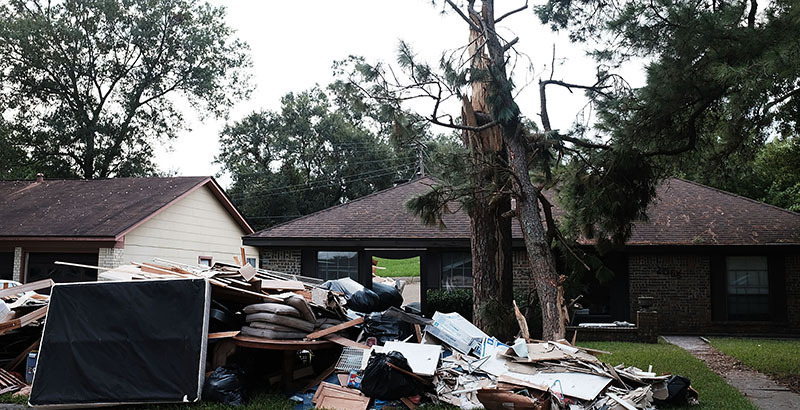 “The effects of Harvey are just humongous and catastrophic,” said Patrick Lopez, a coordinator at the Texas Homeless Education Office, a state agency that provides services and information regarding homelessness. Lopez described the Harvey aftermath as a “long-term, slowly unfolding problem” that will last for years. Many families who had never before experienced poverty were facing homelessness in the days after the storm, and some were worried about the stigma or repercussions of being classified as homeless, he said. Experts said it will take years for communities to recover from these disasters, and families may continue to lose their homes because of lost jobs, rising prices, and other problems. “There will be repercussions for a long, long time” in Texas, Lopez told The 74. 4 Students experiencing homelessness need targeted academic and social-emotional support. Toxic stress caused by homelessness — which often accompanies other traumatic experiences — can cause children to have developmental delays, behavior problems, and mental health problems, according to a report by Firesteel, a Seattle-based advocacy group. Sleep deprivation, hunger, and not having clean clothes or transportation can all cause students to miss school or be distracted during class, which compounds other problems and makes it hard for students to achieve, experts said. But with the right social-emotional and academic support, students can still meet high academic standards while experiencing unstable housing, research shows. Students who are experiencing homelessness are protected under a federal law known as the McKinney-Vento Homeless Assistance Act, which defines homelessness and outlines students’ rights and protections. The law was updated under the Every Student Succeeds Act, which also includes additional policies related to students experiencing homelessness. For example, states will be required to separately report test scores and graduation rates for homeless students and those in transitional housing. Midha said she is hopeful the changes will call attention to the needs of those students and spur improvement in their schools. Disclosure: Bloomberg Philanthropies, the Walton Family Foundation, the Bill & Melinda Gates Foundation, and the Carnegie Corporation of New York provide financial support to The Education Trust and The 74.